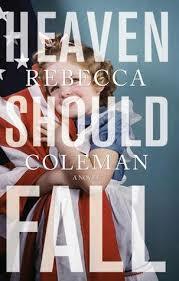 Lazy Day Books is honored to be a part of Rebecca Coleman’s Blog Tour for her new novel Heaven Should Fall. Every day in the month of October, a different blog posted part of Chapter 1. If you missed any previous excerpts, visit Book Trib to read the entire first chapter. It was not attraction I felt, exactly, so much as awe. Here was a soldier, honed like the edge of a blade, yet stretched out before me like a cat on a windowsill. His beauty was not like Cade’s, but it was still beauty. I still try to remember him that way, sometimes. I think he would want me to. Alone since her mother’s death, Jill Wagner wants to eat, sleep and breathe Cade Olmstead when he bursts upon her life—golden, handsome and ambitious. Even putting college on hold feels like a minor sacrifice when she discovers she’s pregnant with Cade’s baby. But it won’t be the last sacrifice she’ll have to make. Retreating to the Olmsteads’ New England farm seems sensible, if not ideal: Jill and Cade will regroup and welcome the baby, surrounded by Cade’s family. But the remote, ramshackle place already feels crowded. Cade’s mother tends to his ailing father, while Cade’s pious sister, her bigoted husband and their rowdy sons overrun the house. Only Cade’s brother, Elias, a combat veteran with a damaged spirit, gives Jill an ally amidst the chaos, along with a glimpse into his disturbing childhood. But his burden is heavy, and she alone cannot kindle his will to live. The tragedy of Elias is like a killing frost, withering Cade in particular, transforming his idealism into bitterness and paranoia. Taking solace in caring for her newborn son, Jill looks up to find her golden boy is gone. In Cade’s place is a desperate man willing to endanger them all in the name of vengeance… unless Jill can find a way out. Alas, I didn’t read it first. But I want to. Hi Taylor! Love your site! I’ll never tell if you read it first 🙂 It’s great you feel that way, because that means your enthusiasm will come through to your readers as you’re promoting the giveaway. This one was a great blog tour, building the excitement a little bit more every day, so by the end, you had to have it!